Certain automakers have taken sedans and smaller vehicles out of their lineups. Volkswagen, on the other hand, continues to promote its four-door-with-a-box offerings. Maybe they have something going with the longevity of models like the Jetta. It can still be had as an economy car like the one I owned in the ’90s. Thankfully, VW also gives the new 2019 Jetta the Execline treatment, and the results are worth checking out. Blue Silk Metallic paint sets off the new no-nonsense sedan lines that improve the new Jetta’s looks. The previous Jetta’s surfaces were flat in comparison. 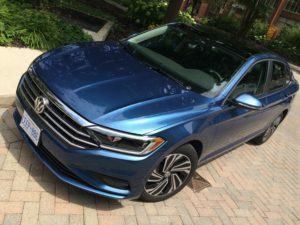 Incidentally, the Jetta I last reviewed, more than two years ago, was also blue… Blue seems to be the colour VW picks for its handsome, understated sedan. That’s in contrast to the habanero orange of the Tiguan, the TNT orange of the Golf R (I can’t tell the difference between Habanero and TNT), and the copper paint job on the Beetle Dune. Finished tailpipes and a mini-spoiler embedded on the trunk lid complete the transformation to a higher-end sedan look. The luxury look continues when you step inside. Understated leather plays its part in a subtly lighted interior that envelops its occupants. Power adjustable leather seats are both heated and cooled. Seat memories include positioning for the power adjustable heated side mirrors. The sunroof takes away more headroom than I want, but I can still sit up straight while I drive and be comfortable. I just need to remember to run a hand through my hair to remove the dent the sunroof’s edge puts in it. Rear seats are equally comfortable, and, at 6’5”, I can almost sit up straight without bending my head back there. 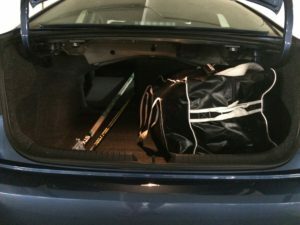 When I owned a Jetta several decades ago, I used to joke that I could play squash in the trunk. That was my way of saying that the car had a massive trunk not just for its size but a massive trunk, period. The high-end theme continues with the sizeable 8.0” touchscreen, angled towards the driver, that handles all infotainment tasks. It’s an upgrade from the 6.5” screen on the base Comfortline trim. Volkswagen’s Composition Media system is your conduit to features here. Voice control, SD card slot, and that rare feature, a proximity sensor that expands icons along the bottom of the screen similar to how you can configure the dock along the bottom edge of a Mac’s screen. If you prefer, Android Auto, Apple CarPlay and Mirrorlink come standard. The Execline upgrade brings an 8-speaker-plus-subwoofer Beats audio system. The Execline’s instrument cluster, outside of the temperature and fuel gauges, is mostly screen, what Volkswagen calls its Digital Cockpit. You flip through various bits of driving data using controls under your right thumb on the steering wheel. Change drive mode and the digitally rendered tachometer and speedometer change their appearance. Data appears logically organized and in large-enough characters to be easily legible in a quick glance. Two USB ports plus a 12V outlet will keep people’s devices charged. Comparisons to higher-end sedans end with the fuel-sipping 1.4L inline-four cylinder turbocharged engine. Peak numbers are 147 hp and 184 lbs-ft of torque. That’s more than enough to meet regular driving needs, but even using the Sport drive mode (you can also choose Normal, Eco and Custom), acceleration won’t be a neck-snapping event in the Jetta. It bears repeating: the 1.4L turbo gives you adequate passing power and feels perfectly at home on a highway cruise. The 8-speed automatic keeps the engine in a quiet sweet spot on the highway. Volkswagen also offers a 6-speed manual transmission with the Jetta, even in Execline trim – yay! The soul of my ’92 Jetta isn’t dead yet! Used with adaptive cruise control set to its highest level (a 3-second following distance, from what I can tell), the civilized ride may fool you into thinking you’re in a much more expensive car. Acceleration and deceleration are always smooth events, unlike the rocket starts some ACC systems provide when the lane ahead clears of traffic. The ACC, BTW, also runs right down to a stop and will get you started again once traffic ahead of you moves. It’s part of VW’s $995 Driver Assistance Package on the Execline. Urban commuters in particular will find that the ACC alone justifies the extra money. cornering lights that enhance visibility during night driving. Jetta drivers may not enjoy the power of performance sedans that this car equals in looks. At the fuel pump, however, VW drivers will justifiably feel superior. The instrument cluster told me the Jetta did about 6.5L / 100 km overall, above-average numbers in a sedan this roomy. Certain highway trips averaged out to 6.0 L/100km or a smidge less. Start-stop technology coupled with the small engine size ought to keep the car from burning too much fuel in city driving. The Jetta takes regular unleaded fuel in its 50L tank. This isn’t a complete list, but you get the point. Again, the engine isn’t hugely powerful, but it is purpose-built for fuel economy and just the right amount of get-up-and-go. Horsepower probably won’t matter to drivers whose feet are not made of lead and whose fuel budgets aren’t bottomless. 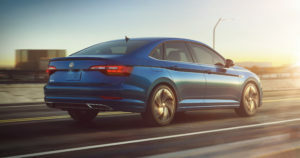 The base MSRP for the 2019 Volkswagen Jetta Execline is $29,095. My tester included VW’s driver assistance package, a $995 option. Freight, PDI and excise tax on air conditioning brings the total to just under $32,000. The base Jetta sells for about $21,000 MSRP. If features like the ones I listed above matter to you, you don’t have a high-end car budget and you can do without excessive amounts of power, check out the Jetta Execline. Those features, ordinarily available only in more expensive vehicles, are a steal in this Jetta.